Music….. is a higher revelation than a wisdom and philosophy. Music…. is the electrical soil in which the spirit lives, thinks and invents. 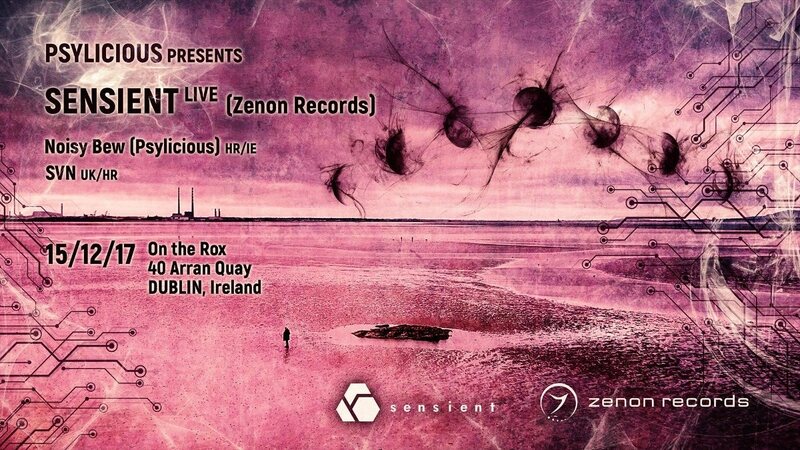 Psylicious is excited to invite you in night full of psychedelic delicious, presenting Sensient (Zenon records). Come and treat yourself with pure progressive sounds delivered live @ On The Rox. Sensients music is deep, intelligent, progressive and absorbs the influence of many other musical styles (minimal, techno, breaks, glitch, jazz fusion). In 2003 Sentient created Zenon Records which has now developed into one of the world’s best and most respected psytrance labels. He has released 8 solo albums plus many compilation tracks on respected labels like Iboga, Plusquam, Flow, Plastik Park, Tatsu, ZMA and more. He also has made remixes for some of the big names in the scene including Boris Brechja, Ace Ventura, Perfect Stranger, Shiva Chandra and BigWig. Zenon has formed an entire musical movement which has heavily influenced the Psytrance Music/Festival scene worldwide. Psylicious is underground project founded in Crioatia (Zagreb) home of the greatest festivals in Europe. Founder of Psylicious is Noisy Bew, djane whose vision is presenting music like piece of art in all its greatness (musically and visually). Blending this two segments and expanding a boundaries Psylicious opens its door to you for the first time in Dublin, Ireland.